OLA strives to ensure residents feel safe and comfortable in our compassionate, joyful environment. Thank you to our OLA team for your dedication, hard work and person-centered care. There are not many people at Our Lady of Angels Retirement Home who do not know the name, Bonita Kimbrough. A familiar face of OLA, Bonita, has touched the lives of many over her 20 years as a nurse. Inching towards part-time work and eventually retirement, Bonita happily shares her thoughts on her time at OLA. Bonita has made an impact on the OLA community and will be dearly missed when she retires. 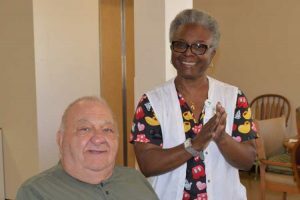 Our Lady of Angels Retirement Home, a resident-centered, retirement home community providing high-quality care and rehabilitation services for seniors. Join our team! Visit us at olaretirement.org/employment or call us at 815-725-6631 for more information.